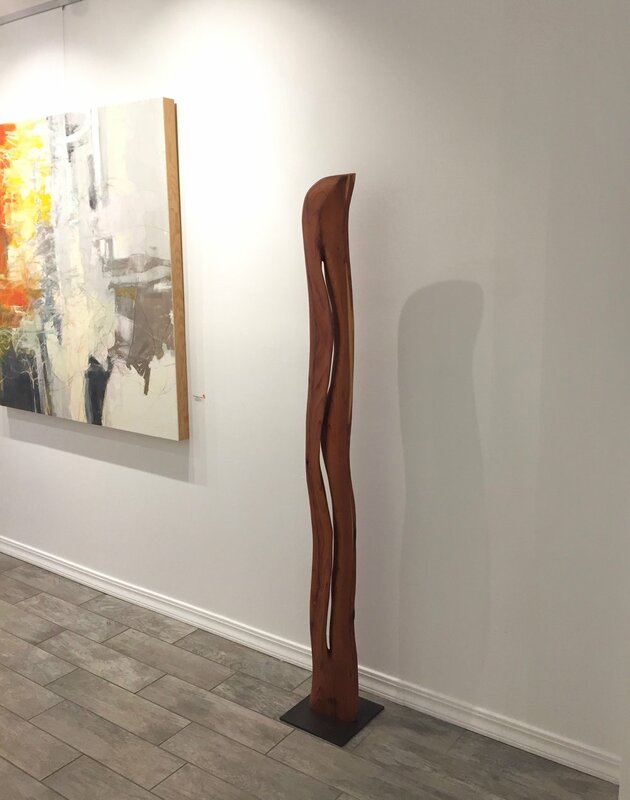 Desta Gallery, a contemporary fine art gallery in San Anselmo, is currently showing selected works of my “Flow” sculpture series. The Gallery is dedicated to showing contemporary and modern art that offers reflection, introspection, and connection. I am very excited and grateful for having my work presented in their beautiful space, among many other emerging and established artists, including John Wood (paintings in the background). 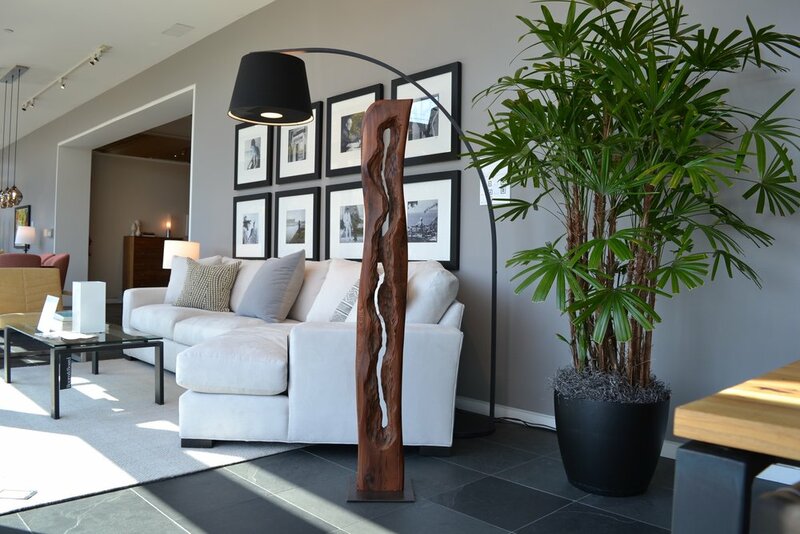 The communities around San Anselmo and Fairfax are known for their love and respect of earth, nature and environment, and my work of reclaimed wood sculptures feel right at home here. The gallery is open Tuesday to Saturday from 11am to 5pm. Please make sure to visit the gallery when you are in the neighborhood. The SFMOMA Artists Gallery will present a selection of my recent contemporary sculptures and wall art in the upcoming “Small Works” exhibition at their Fort Mason gallery starting December 1, 2018. The exhibit features works by Pablo Bautista, John Buckling, Lutz Hornischer, Beryl Landau and others. I am very excited about this opportunity to show my work and I hope you can visit the exhibition that runs until January 20, 2019. As we approach the holidays, I am grateful that I was invited to show my work in an holiday exhibition at SHOH Gallery in Berkeley, featuring colorful and tactile works by seven local Bay Area artists: Encaustic, oil & acrylic paintings, mosaic, mixed media and sculpture. SHOH Gallery is located in the artsy neighborhood of the Gilman District and is a beautiful space for showing and enjoying fine art. The moment you enter the gallery you leave the busy industrial setting and dive into an almost meditative space. Please visit the gallery if you have not been there. The current show runs until January 18, 2019. Looking for a unique holiday gift for somebody special or for yourself? How about original art from the Holiday ART Annex hosted by h u g o m e n t o featuring five local artists: Handcrafted ceramics by Len Carella, Carole Neilson and Hideo Yoshida, reclaimed wood sculptures by Lutz Hornischer, contemporary fiber art by Ealish Wilson and more. Come join me and my fellow artists. I am very excited and grateful that Room and Board San Francisco has invited me back for the 2018 Open Studios hosted by ArtSpan. I will show my new sculptures and wall art along with 11 other local artists in Room and Board’s beautiful showroom at 685 Seventh Street, San Francisco in the SOMA neighborhood. The Open Studios get kicked off with an artist reception on Thursday, October 11, 2018 from 6 to 8pm with an art preview, live music, wine and food. Please RSVP now. The Open Studios, with artists present, will be on Saturday, October 13 from 10am to 6pm and Sunday, October 14 from 11am to 6pm. This is a unique opportunity to see great art in a stunning setting with designer furniture and a chance to talk to the artists. Hope to see you. The following art galleries and venues in the San Francisco Bay Area are currently showing my contemporary sculptures and modern wall art pieces. In addition, I have several artwork pieces in my studio gallery and I am happy to give you a tour to show my work and also explain my artistic process in more detail. Please contact me or any of the following galleries to see and buy my artwork. I am very pleased to announce that my contemporary wall sculpture "Big Puzzle of Life" has been accepted into the art auction Art for AIDS, an annual art auction benefiting the UCSF Alliance Health Project. It is a juried live and silent auction, with gourmet food provided by some of the Bay Areas finest restaurants and wineries. My work "Big Puzzle of Life" is made out of 210 pieces of reclaimed redwood, laminated, carved and finished with oil. The wall sculpture was inspired by the observation that life is formed by a series of choices, experiences, events and learnings. Each unique piece of reclaimed wood represents one of those steps, adding context and direction, and thereby creating a rich, unpredictable and interesting path. Last weekend I showed my work at the Mill Valley Art Festival, a beautiful venue for sharing and experiencing art. The yearly juried festival features 150 artists across the United States in a park like setting in the redwoods. The festival is in its 62nd year and is one of the top art festivals in the Bay Area. I am grateful that my work was selected and I could participate in this event. At the art festival I exhibited several new contemporary wall art pieces made from reclaimed redwood, including “Go with the Flow III”, “Flowery” and “Little Marblings” - see photo below. The Sausalito Art Festival, America's Premiere Waterfront Art Festival, is held annually on Labor Day Weekend, Sept 1, 2, and 3, 2018. I am very excited that my work was selected for the 2018 festival. I will show my newest work of contemporary sculptures and wall art made from reclaimed wood. The event features fine art from 200+ artists, music, food, and wine and is considering one of the most prestigious art festivals in the country. I hope you can join me. North Berkeley Investment Partners, an advisory company with a commitment to sustainability and social responsible communities is hosting a new art exhibition in its offices. The new exhibition is called "Reclamation" and features selected works by local artists Wilma Wyss, Lutz Hornischer and Shelley Gardener. The theme of the show is based on reclaimed and recycled materials acting as inspiration for creating something new and extraordinary. The exhibition runs from July 16 to September 29, 2018. You are invited to the Opening Reception and Party on Thursday, July 26, 2018 from 5:30 to 8pm at 1820 Solano Ave, Berkeley CA. More information and RSVP. Only a block away from the Minnesota Street Project Art Galleries is another beautiful gallery, h u g o m e n t o. This gallery in the San Francisco Dogpatch neighborhood is currently featuring my sculptures and wall art together with ceramics artist Carole Neilson. The show, called "Sawdust Rising - The After Afterlife of Trees", runs through September 15, 2018.
h u g o m e n t o, owned and curated by Hugo Lai, presents storied art & objects from near and afar. Hugo has established a very unique and inviting space where artwork comes alive. Below are some photos (photo credit: Hugo Lai) of my and Carole's artwork in his inspiring gallery. Enjoy! SHOH Art Gallery (SHOHARTS) in collaboration with OkStereo opened a new show on June 1, 2018 with seven contemporary artists from the Bay Area - Carol Aust, Lutz Hornischer, Heide McDowell, Francesca Saveri, Kirsten Tradowsky, Jan Wurm and Stephen Namara. I am honored to be part of this exhibition with five of my sculptures and wall art pieces. 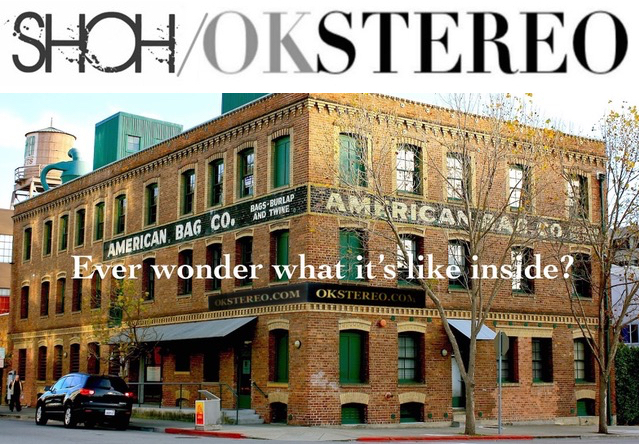 The exhibition is installed in the beautiful Oakland landmark building "American Bag Co" on third street and curated by SHOH (SHOH's main gallery is in the Gilman district of Berkeley). Showing by appointment only, please contact SHOH Gallery to see and purchase the artwork. The East Bay Open Studios are coming up on June 2/3 and June 9/10 2018 in the San Francisco East Bay. This is a great opportunity to discover new art and to meet local artists in their studios. This year there will be more that 190 participating artists across Berkeley, Oakland, Richmond, Albany and other East Bay cities. I will also open my studio on both weekends from 11am to 5pm and hope to see you. For location and schedule details, please go to the East Bay Open Studios website. Come join us for the upcoming show "Sawdust Rising - The After Afterlife of Trees" presented by h u g o m e n t o in San Francisco, starting on June 2, 2018. My sculptural work will be shown together with ceramics by artist Carole Neilson. Our creations are leveraging recycled materials, bringing the past back to life and embracing the beauty of natural imperfections. In the process, sawdust arises: My work produces sawdust when I carve into reclaimed redwood, and Carole uses sawdust to smoke fire her beautiful ceramics. h u go m e n t o is an art gallery/concept shop in Dogpatch, San Francisco, offering storied art & objects from near and afar. We are looking forward to seeing you at the artist reception. 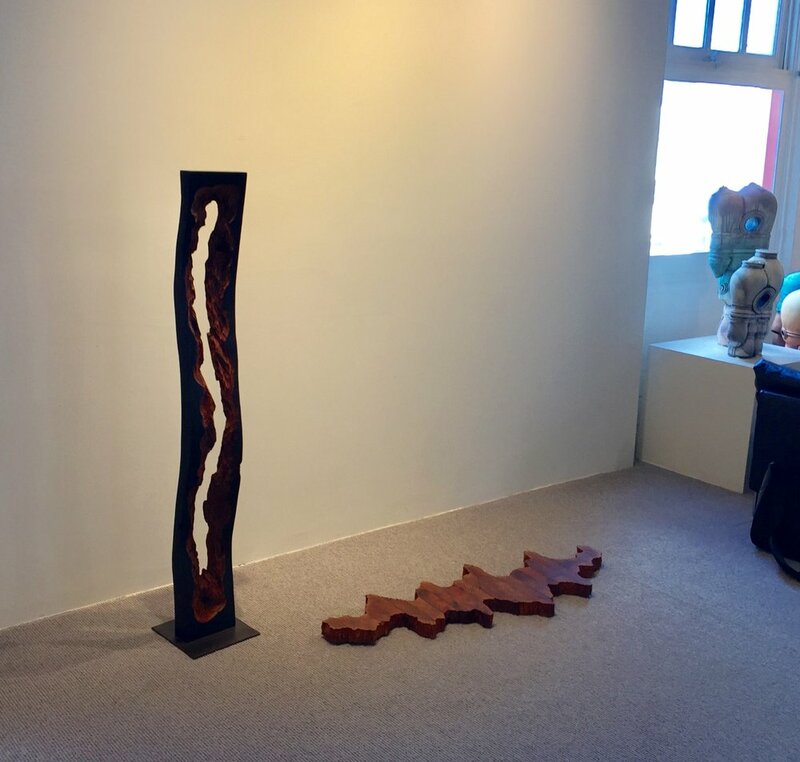 h u g o m e n t o Art Gallery presents "Sawdust Rising - The After Afterlife of Trees" featuring wood sculptures by Lutz Hornischer and smoke fired ceramics by Carole Neilson. 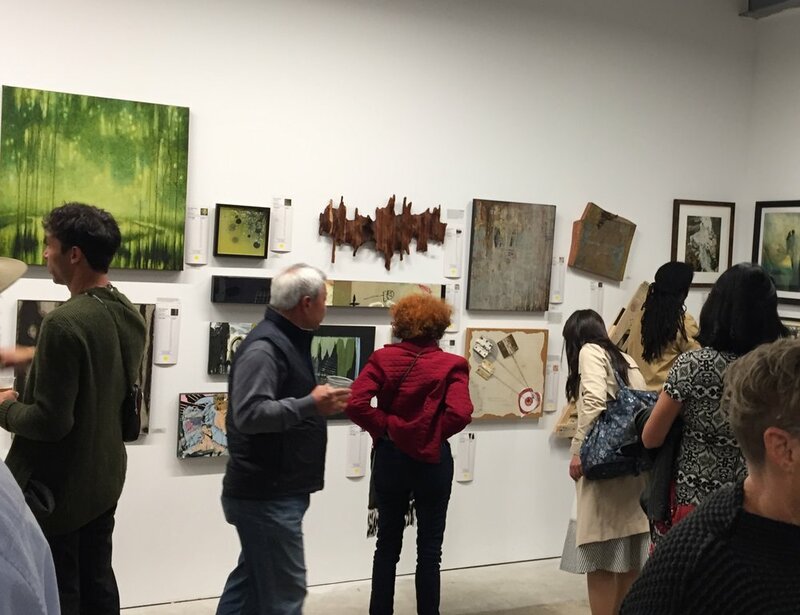 Last week, Minnesota Street Project hosted the annual art benefit auction for Hospitality House, a community center serving residents of the Tenderloin, SOMA and Mid-Market of San Francisco with programs to overcome chronic poverty and its effects. Many local artists donated artwork that was auctioned in a live and silent auction to raise money for this organization and programs. It was exciting to see so many different artworks from other local artists and also to be part of this community helping to raise funds for a good cause. Last week I dropped off a few new sculptures and wall art at SFMOMA Artist Gallery at Fort Mason in San Francisco. The Artist Gallery represents emerging and established contemporary artists of California, and I am very honored that they represent my work. The gallery provides art placement services to architects, interior designers, corporations and individuals. They have a beautiful space at Fort Mason and you can make an appointment to see my work and art from many other local artists. Two of the new pieces I have on display at the SFMOMA Artist Gallery are "Contemporary Driftwood" and "Around the World". Last weekend, March 24, 2018, was the ArtSpan Benefit Art Auction in San Francisco, and this years event was even more successful than last year. And it was also a lot of fun with good food and the opportunity to meet fellow artists and collectors. 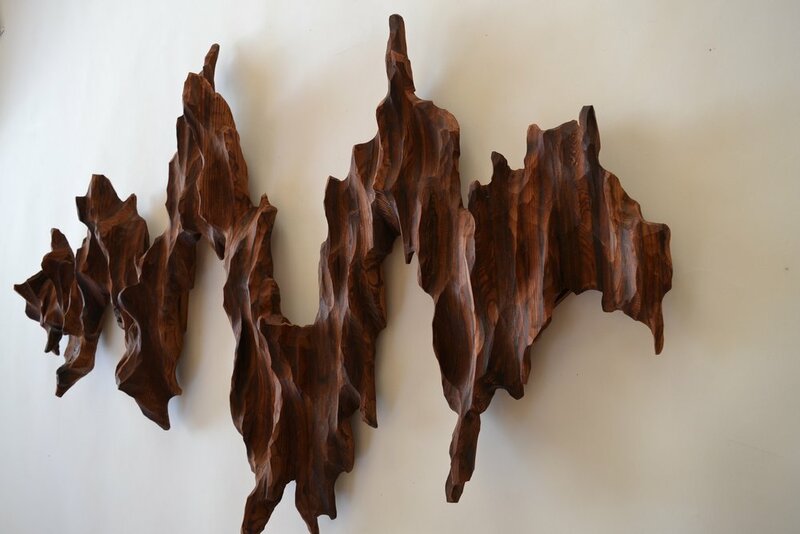 My wooden wall sculpture "Wild Times" was featured in the silent auction and I am happy to say that it raised a substantial amount for the ArtSpan organization. This year's fundraiser was focused on raising money for the new ArtSpan Onondaga Art Center. Thank you all for supporting the local artist community of the San Francisco Bay Area. And a big thank you to the ArtSpan team and all the volunteers to hosting a great event. I am very exited that my work was selected again for the upcoming Yountville Art Festival - Art, Sip and Stroll on April 28, 2018 in the beautiful town of Yountville. 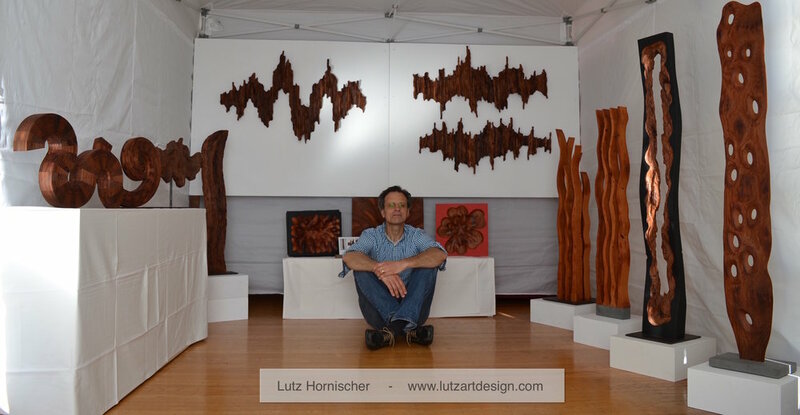 I have a new booth setup and will show new work, both sculptures and wall art, all made for reclaimed redwood. In addition to amazing art from over 40 artists, there will be plenty of good food, wine and music. For more details check out the art festival website. Hope to see you there - you don't want to miss it. The location and the vibe of the show is just beautiful and inspiring. 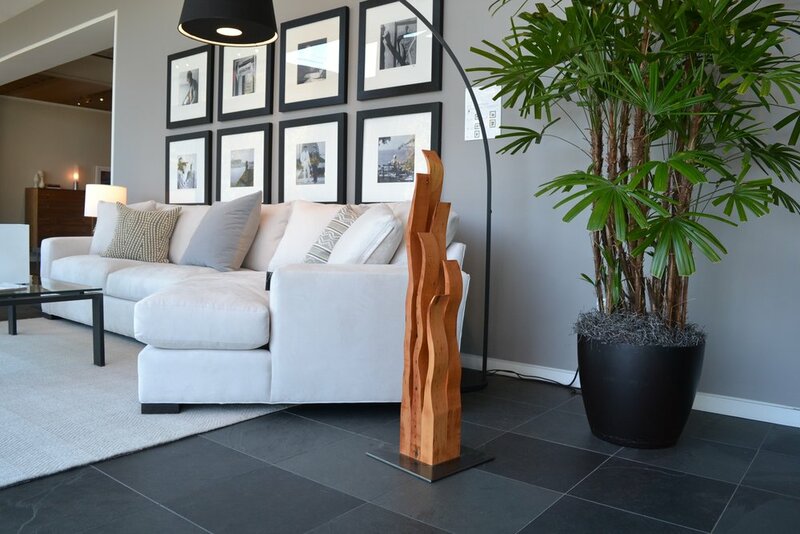 As part of the recent Open Studio at Room and Board, the San Francisco online magazine BobCut wrote a nice article about my wood sculptures, my inspiration, the sustainability aspect of my work and my artistic process. Read full article. I am very excited that Room and Board of San Francisco has invited me to show my work at their San Francisco showroom for the upcoming SF Open Studio by ArtSpan.org. Room and Board is hosting 16 local artists and kicks off the art show with an artist reception on Thursday, November 2, 2017 from 6 to 8pm at 685 Seventh Street in San Francisco. Enjoy beautiful art, live music by Caleb Murray and the Blue Horizon and food from Troya, a local modern Turkish Mediterranean eatery. If you can't make it to the opening reception, you can also see the artwork at Room and Board's beautiful showroom on the official SF Open Studio weekend, November 4 and 5, 2017 from 11am to 6pm. Don't miss the opportunity to see great local art in a stunning showroom and the chance to talk to the artists. Hope to see you. We Are Currently Obsessed with Artist Lutz Hornischer's Reclaimed Wood Sculptures.